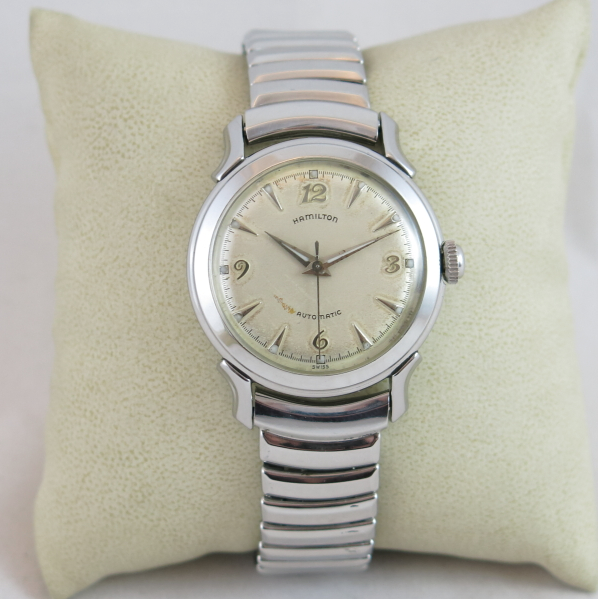 Hamilton first introduced Automatic watches in 1954 with a dozen new designs, including it's first calendar watch. 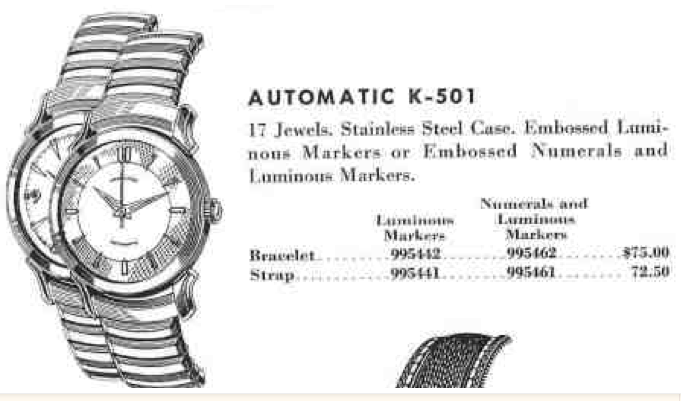 One of the new automatics in stainless steel was the K-501. It was produced for only two years. 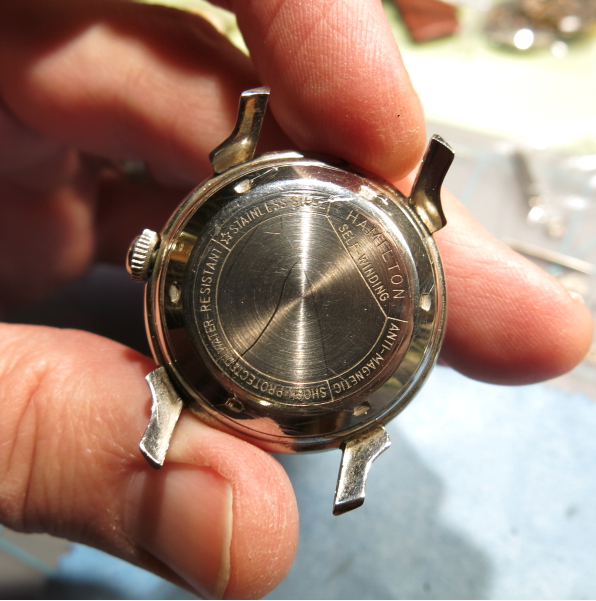 The K-501 was offered with two styles of embossed dials… one with all markers and done with numerals and markers. Both dial have luminous hands and lume on the markers. 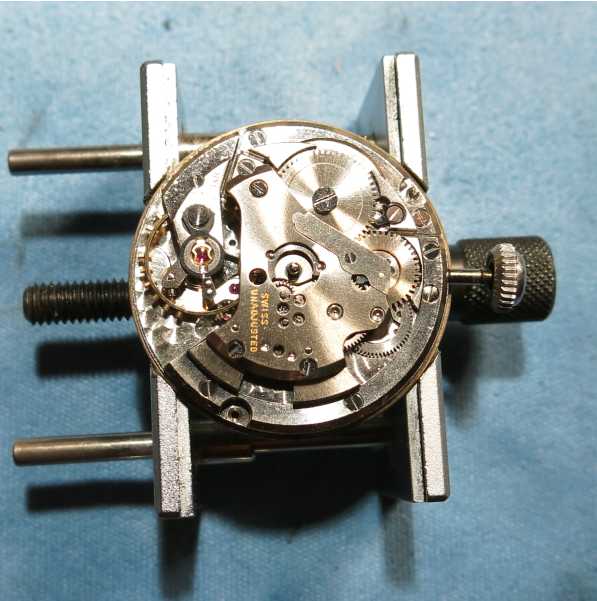 Under the dial you might find a Hamilton 658 movement or the more common 661 grade. The 658 was used initially but replaced by the 661. You don't see 658's very often. I lucked out recently and found a K-501 with it's original bracelet and it's original ivory-colored box. The box is unlike any other box I've seen. 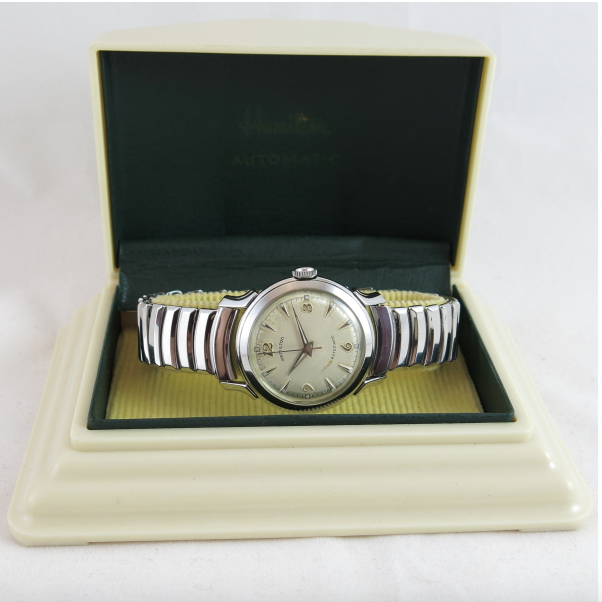 It has a green interior marked "Hamilton Automatic" with a creme corduroy base. 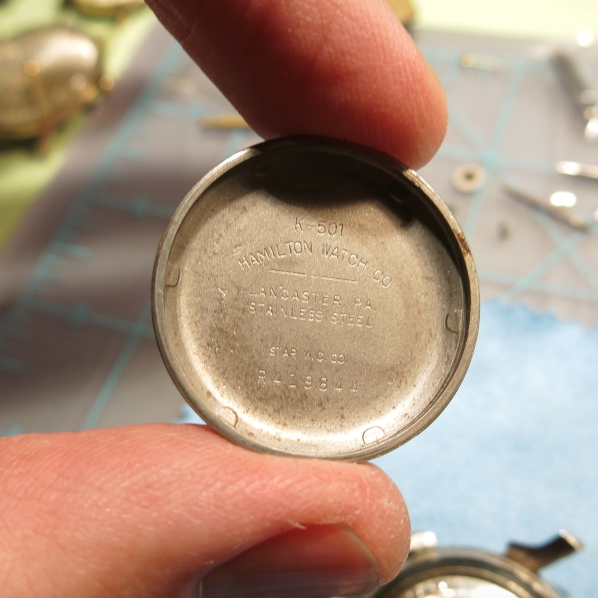 The stainless steel back screws off and there are a few tool marks from prior attempts to open the watch. These cases have relatively deep slots for case opener but depending upon the condition of the watch they can be a real bear to open sometimes. The ideal tool would have six teeth to engage the slots. My tool has three and works fairly well. Some tools only have two - they are close to useless if the case is on tight. The back is clearly marked K-501. 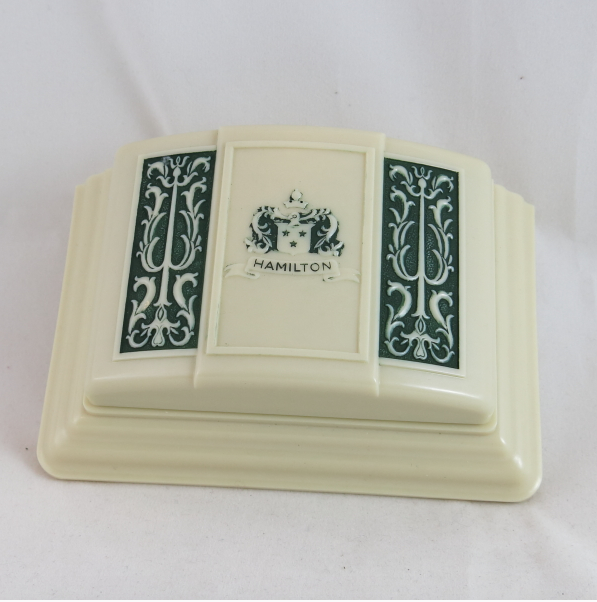 It's not always marked and sometimes it's marked with something else - later in the 1950's Hamilton was known to use whatever was similar enough to work when supplies got tight during times like holidays, etc. The same is known to be true for hands… occasionally a different style could be substituted if the intended style was out of stock. The embossed marker and numeral dial is similar to what is used on other models but this one has silver-colored figures. I'm a little gun-shy at cleaning dials after my Rotomatic III fiasco but I'll try to clean this dial up anyway. The 661 has a neat little toggle switch to engage or disengage the rotor from the carrier below it. All you do is slide it to the left and then rotate the rotor until it gets to the position where it will fall off. It goes back on the same way… once it's on, just flip the switch to the right. Here's the movement, sans-rotor, showing the carrier below. There's a series of gears that transmit the rotor's energy to the winding wheel. 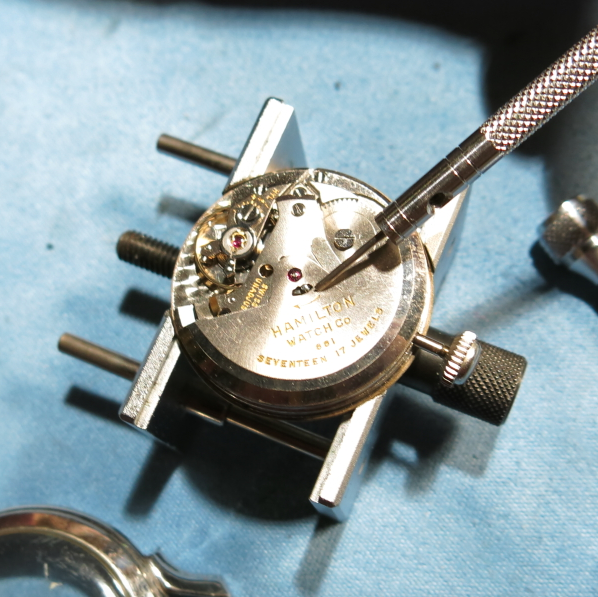 The clutch wheel (on the below right of the movement) allows the rotor to wind the watch but not the crown to wind the rotor when you manually wind the watch. Everything gets taken apart, cleaned and oiled and then goes back into the case. Check out how sparkly the cleaned up movement is now compared to the haze in the shots above. 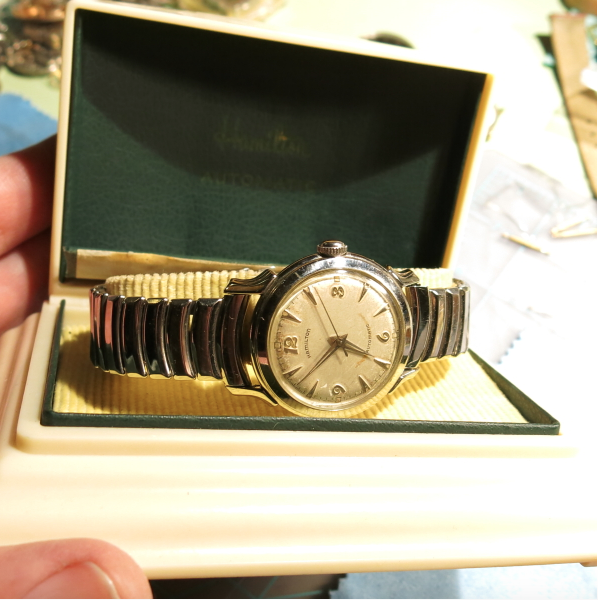 As a general rule, a recently serviced watch should sparkle. 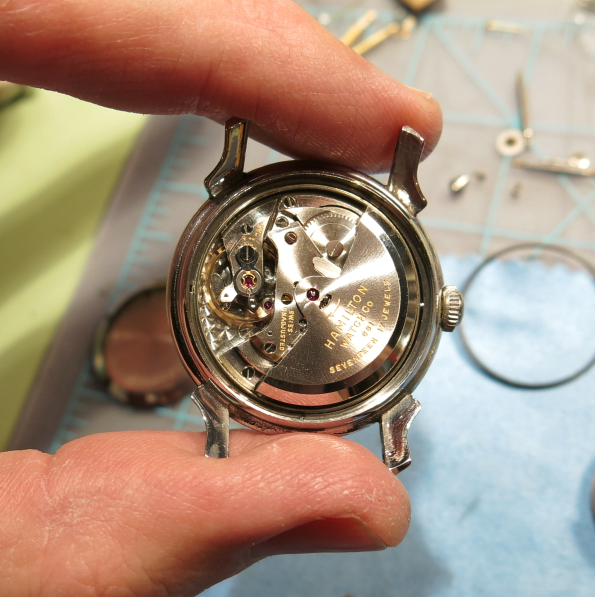 If you see a watch for sale that doesn't show a shiny movement, you may want to assume it hasn't been serviced, even if they say it has. 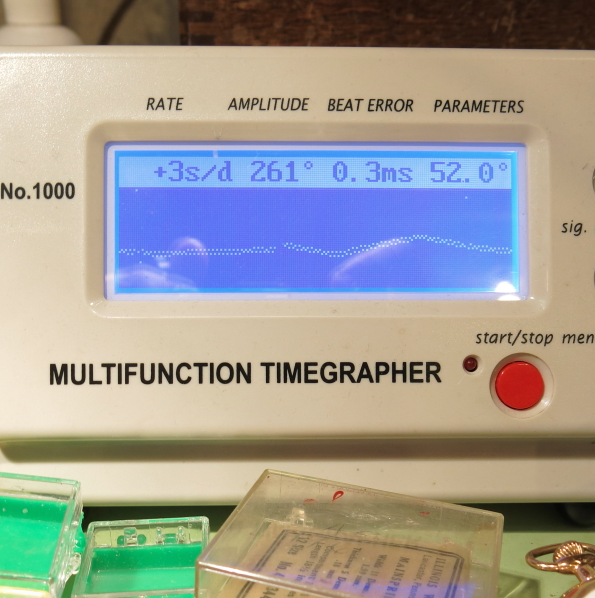 In the shot below of my timer you can see the effects of me tweaking the regulator on the right side and how it leveled out on the left side. This movement is running very nicely. And here is it all cleaned up. 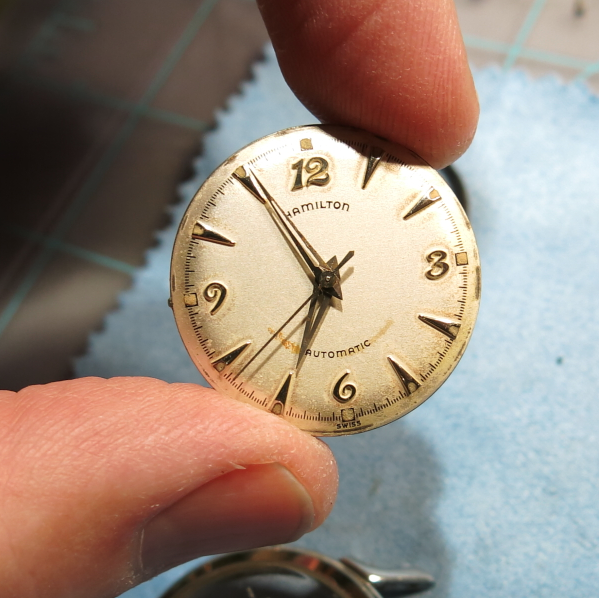 The dial cleaned up well and I relumed the hands and the dial markers. Here's a shot of it back in it's original box. Check out the green lid on the box… you don't see this style of box very often.